Athena Industrial Gases manufacturers gas sampling bottle and are specially designed to collect and store high pressure gas samples from the field & transport the same to laboratories. Procured from well-established manufacturers, these are made to undergo rigorous quality control tests to ensure high performance. We manufacture quality gas sampling bottles. The product & the Quality has received acceptance from most of the leading industrial establishments, Top level Research Originations, Laboratories, Refineries, mines, chemical Industries, Fertilizer, pharmaceutical Enterprises. 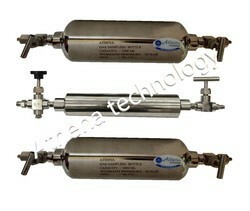 Athena Gas Sampling Bottles are manufactured in S.S. 316 construction. Each bottle is tested to hydraulic test pressure of 250 bar. Suitable for working pressure of 150 bar. Athena Industrial Gases manufacturers Oil/Gas sampling bottle and are specially designed to collect and store high-pressure Oil/Gas samples from the field & transport the same to laboratories. Procured from well-established manufacturers, these are made to undergo rigorous quality control tests to ensure high performance. We manufacture quality gas/oil sampling bottles. The product & the Quality has received acceptance from most of the leading industrial establishments, Top level Research Originations, Laboratories, Refineries, mines, chemical Industries, Fertilizer, pharmaceutical Enterprises. 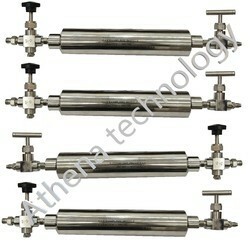 Athena Gas/Oil Sampling Bottles are manufactured in S.S. 316/304 construction. The products are used for sampling, carrying and storing Ethane, Ethylene, Propane, Propylene butadiene gas or any other gas and liquid product. Model BPY’s sample cylinder allows gas samples to be collected at pressure, assuring that the sample constituents that can change state with pressure reduction are not lost during sample collection. An example of this type of sample would be LPG or other two-phase fluids that could flash off sample constituents if the pressure was reduced. Designed using superior quality stainless steel, which is sourced from authentic vendors, our range of LPG Sampling Cylinders is high in demand amongst the clients. 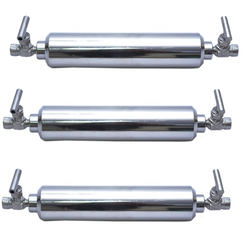 These cylinders are designed as per ASTM 1265 and are offered in various sizes, designs & shapes. Besides, the range of cylinders offered by us is available in the capacities of 300 ml., 500 ml., 1000 ml., 2000 ml., 3000 ml., and 8000 ml. Gas Sampling Bomb, Gas sampling bottles that are specially designed to collect and store high pressure gas samples from the field & transport the same to laboratories. Superior in quality, these bottles pass through rigorous quality control tests and inspections to ensure maximum integrity and cleaning process for effective corrosion resistance. Designed as per exact industry standards and guidelines, the gas sampling bottles are available in different sizes and specifications. Sample Cylinder offer a way to collect pressurized samples in a transportable container. Sample Cylinders can be arranged with a wide range of options including different end connections, and valve styles. Athena Industrial Gases manufacturers Oil/Gas sampling bottle are specially designed to collect and store high pressure Oil/Gas samples from the field & transport the same to laboratories. Procured from well-established manufacturers, these are made to undergo rigorous quality control tests to ensure high performance. We manufacture quality gas/oil sampling bottles. The product & the Quality has received acceptance from most of the leading industrial establishments, Top level Research Origination, Laboratories, Refineries, mines, chemical Industries, Fertilizer, pharmaceutical Enterprises. Looking for Gas Sampling Bomb ?